Saw this advertisement this morning- in the Sun Sentinel. Jeff Eats and Mrs. Jeff Eats caught The Mersey Beatles on 2/17/16 at the Crest Theatre @ Old School Square and I gotta tell you guys- that this Liverpool based group was one of the best Beatles’ tribute bands that we’ve ever seen. 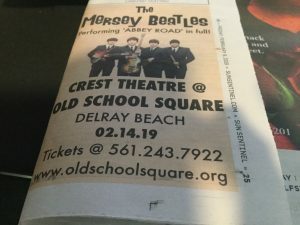 If the Crest Theatre date doesn’t work for you, check themerseybeatles.com- for the band’s upcoming Florida tour schedule.